If you’ve been to Burning Man, you’ve probably seen someone under the influence of illegal drugs. Perhaps you even partook yourself. It’s kind of hard to avoid, even with cops and Feds out there looking for them with sniffer dog teams. There are Sober Camps out there for those who need them. This documentary was produced by Adrian Grenier of Entourage (possible Burner) and Directed by Matthew Cooke. It stars huge fan Burner Susan Sarandon, Burner Woody Harrelson, rapper 50 Cent and hiphop Kingpin Russell Simmons, as well as creator of “best TV show ever broadcast” The Wire David Simon, who recently said “there are now two Americas. My country is a horror show”. 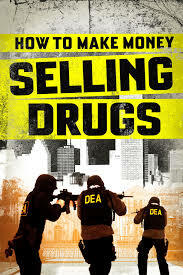 How To Make Money Selling Drugs is brilliantly made and should be compulsory viewing for all Burners, friends, family, politicians, church leaders, cops…everybody. Highly, highly recommended – you can get it on YouTube (paid) or Amazon On-Demand (free if you’re a Prime subscriber, $2.99 to rent otherwise).